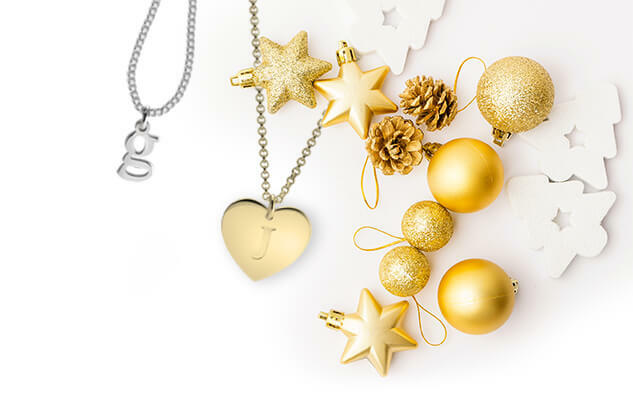 Buying a new necklace is exciting but before rushing into any purchase it is important to factor in not only the look of the pendant but the length of the chain. It is necessary to consider the chain length that fits factors beyond your outfit and personal style. 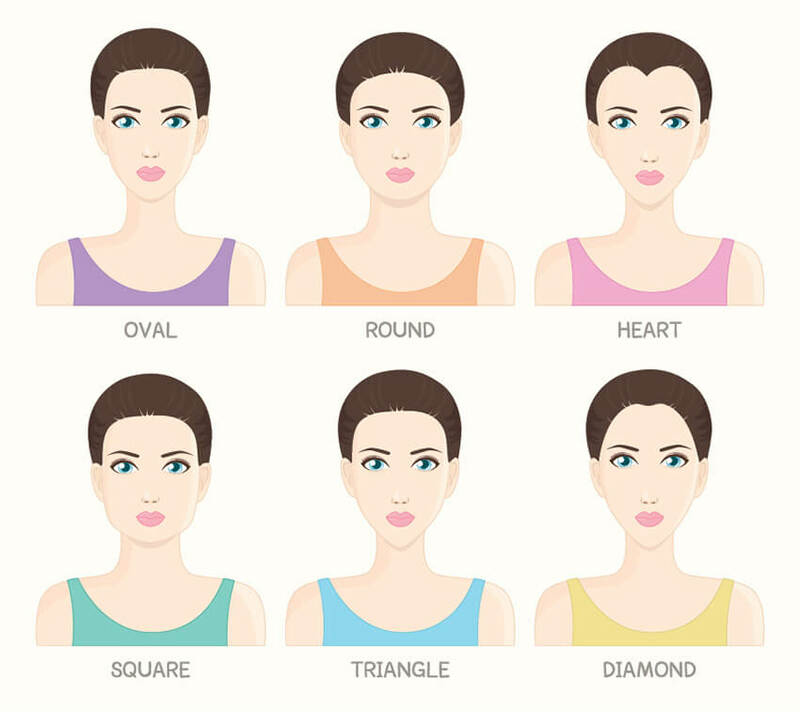 Necklaces or chains come in industry standard lengths; five different lengths for women, and four for men.This handy guide will assist you selecting the right necklace length that will best showcase your jewellery, accentuate your best features, suit your body type, and frame your face. When worn correctly, jewellery can draw people to look at your best assets and focus away attention from the features you would rather not flaunt. The first step is it to learn where different necklace lengths fall on the body for either men or women. This will assist you in choosing which chain length you desire. 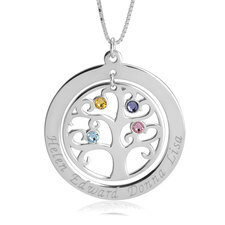 Women’s necklaces are standardly sold in even-inch lengths. Follow this chart to learn where each necklace length falls on the average woman’s body. 16" Necklace Falls perfectly around the base of the neck like a collar. On a petite woman it hangs loosely around the neck and falls just at the collarbone. On a plus size women it might sit more like a choker. 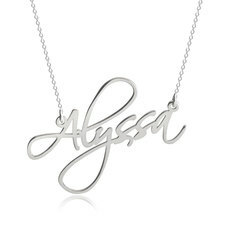 18" Necklace A common choice for women that sits elegantly on the collarbone. 20" Necklace Will fall just below the collarbone. Follow this guide to see where different chain lengths fall on the average size male. 18" Necklace Sits at the base of the neck (for smaller neck sizes). 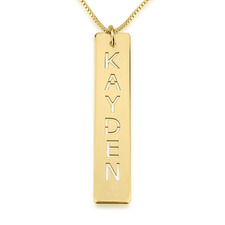 20" Necklace Reaches the collarbone (most common length for average men). 22" Necklace Falls a few inches below the collarbone. 24" Necklace Reaches just above the sternum. The right necklace can really pull any outfit together and be the focal point of a woman’s body. It is therefore important to consider how the length of the necklace will compliment your body. When selecting the correct chain length for your necklace it is important to consider such features as your neck, your height, your body type and your face shape. If possible, take the time to measure your neck before purchasing any necklace and most importantly a choker. The easiest way to measure your neck is to gently take a soft measuring tape and wrap it closely around your neck. 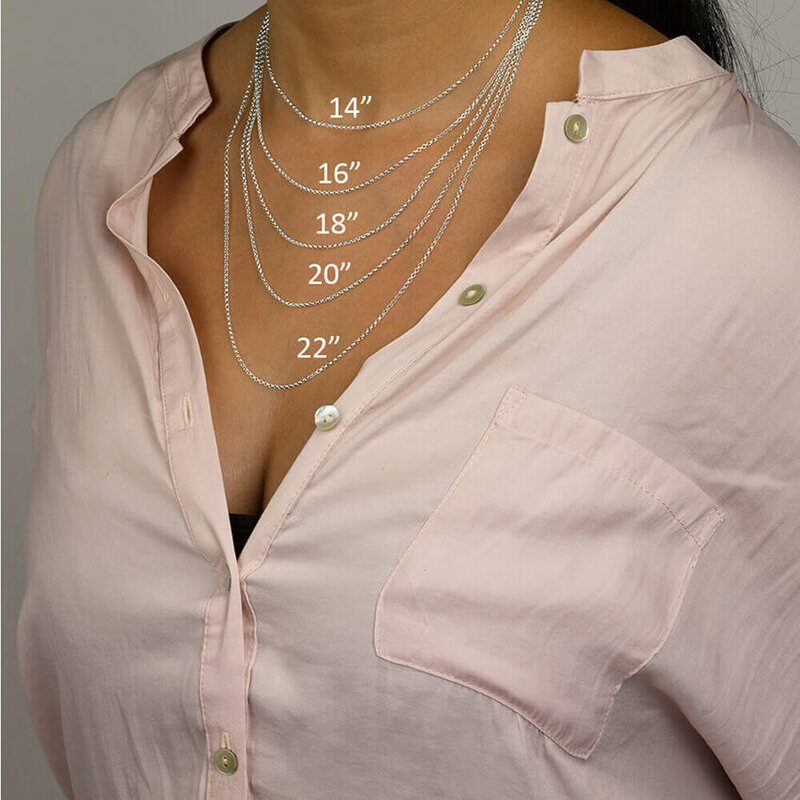 Whatever your neck measurement is, add two inches to that and that’s a comfortable length for chokers which are usually sized at 16 inches; add four inches to that and that’s a great length for a pendant or name necklace which is usually attached on an 18-inch chain for women. Chokers work best for people with long necks while short necked individuals are better off staying away from it. 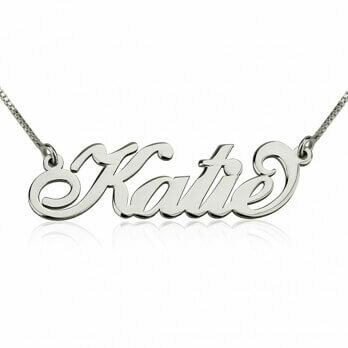 Your height is another factor to consider when choosing the perfect necklace chain to flatter your body type. Women below 5’4” look best in 16 to 20 inch necklace lengths. A long necklace tends to overwhelm a smaller frame. Women who fall between the height of 5’4” to 5’7” can wear necklace of any length. Taller women who are 5’7” or above can wear any length necklace. Longer chain style necklaces look best on taller women as they accentuate a tall frame. In terms of necklaces, remember that people’s eyes will stop at the point where your necklace ends so if you don’t want them looking at that part then, avoid necklaces that end there. 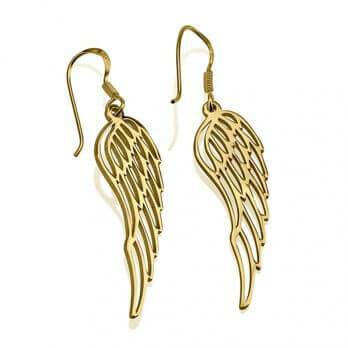 For women with smaller bust, a long thin chain or long layered chains would look great on you. The kind of necklace that sits below the breast line should be avoided by full figured women as this length necklace will not hang properly. Instead, try a necklace that sits slightly higher on the body, such as an 18- to 22-inch necklace. Another purpose of necklaces aside from being an accessory is that it actually helps frame your face. As with the body type, a necklace can help you accentuate your strongest facial features and alter the way your face is perceived by others. Women with round faces should avoid short necklaces or chokers as they will accentuate the roundness of her face. Those with oval shaped faces can take advantage of any necklace fad since they can wear almost any shape, length or type of necklace. For those with a long-shape face who may want to broaden and soften the shape of their faces, should wear shorter necklaces. Short, round necklaces will keep from adding length. 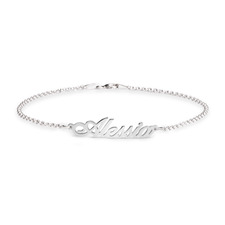 Look for choker and princess necklaces, measuring between 16” – 18”. Heart shaped faces look great with chokers or any short necklace as they create an illusion of fullness and balance out a narrow chin. Choosing the right necklace is similar to shopping for the perfect pair of jeans. It’s important to consider what flatters your body type and not jump to buy solely based on what’s currently on trend. 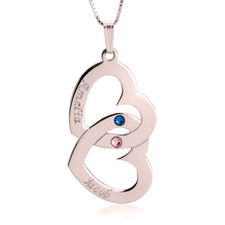 At oNecklace we feature a range of chain lengths and styles of necklaces you are sure to love. Better yet, they are all personalizable!